Had a blast with a great bunch of kids in Warrington PA today! 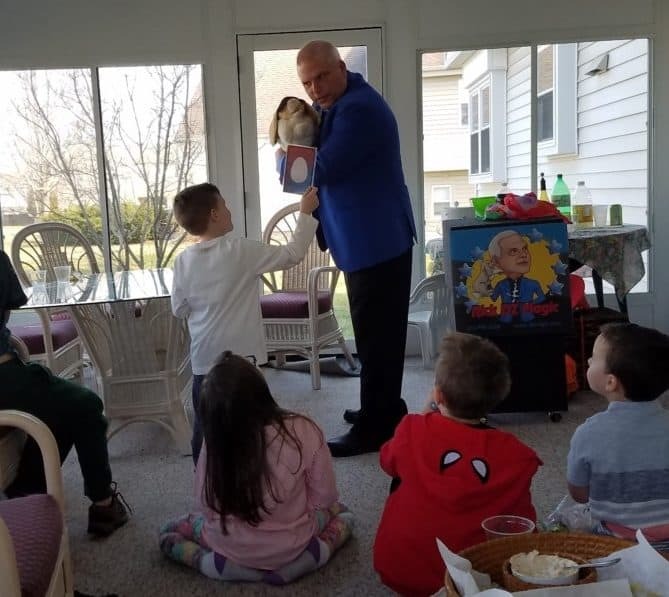 GrandMom & GrandDad had all of their kids and grandchildren over for an Easter celebration and the evening before they decided it would be fun to do something extra this year. Luckily I had a timeslot open and live nearby to Warrington, so I was able to help them out. I enjoyed it thoroughly because I have a TON of Easter-themed tricks using bunnies and eggs, and for once I got to use them ALL. I also got to practice some Easter balloon sculptures including a chick, a duck, and of course a rabbit! The reactions from the grandkids were spectacular - they were LOUD and really enjoyed themselves. Got a nice review from their Grandfather too. My daughter Anastasia has performed in the North Penn High School Talent Show all three years now. She planned and auditioned with a large illusion that was simply spectacular. She had always dreamed of doing something huge in her senior year, and through the generosity of local professional magician Mike Bonacci, who let us borrow one, she seemed all good to go. Well, she made it through the audition, but the week of the show there were two days of tech & sound rehearsals and a dress rehearsal. And none of the assistants were able to make it to those. The situation was bleak. Without attending these practices, the big show was a no-go. Luckily, Anastasia has some experience in the magic biz, and with just 48 hours before showtime, she came up with and prepared an entirely different act that needed no assistants. It also wasn't (apparently) a big illusion. Today I worked on learning Mike Kaminskas new effect "KFC," which has some interesting applications for closeup magic and may well add some "spice" to my performances! I have been experimenting with Thumbtack, a service which links service providers with prospective clients, in my case magicians or balloon artists to party or event planners. The magician pays a small fee for each lead and that entitles them to present a quot to the prospective customer. I'll post back as I see how or if this works.